Tomorrow I will be off to Jiri by local bus, a ride I am dreading, as even when I was twenty years younger it was one hell of an uncomfortable ride. It is however the only way, short of hiring a taxi for around $150, to get there. Jiri is an alternative starting point for the Everest trek and used mainly by those with time on their hands as it adds about a week to the trek each way and is considered hard going. The road officially goes as far as Shivalaya but I have been reliably informed that a landslide has taken care of the section beyond Jiri so that’s as far as the bus will go. From Jiri it will be shanks pony all the way. The trail goes against the grain of the land so every day you are either going up a ridge or down one the other side. On day 4 you cross the Lamjura pass at 3530 meters before descending to the Ringmo Khola a thousand meters lower. The next day you go back up to 3071 mtrs at Trakshindo La. Then it’s down a long way to 1400 mtrs at the Dudh Kosi. 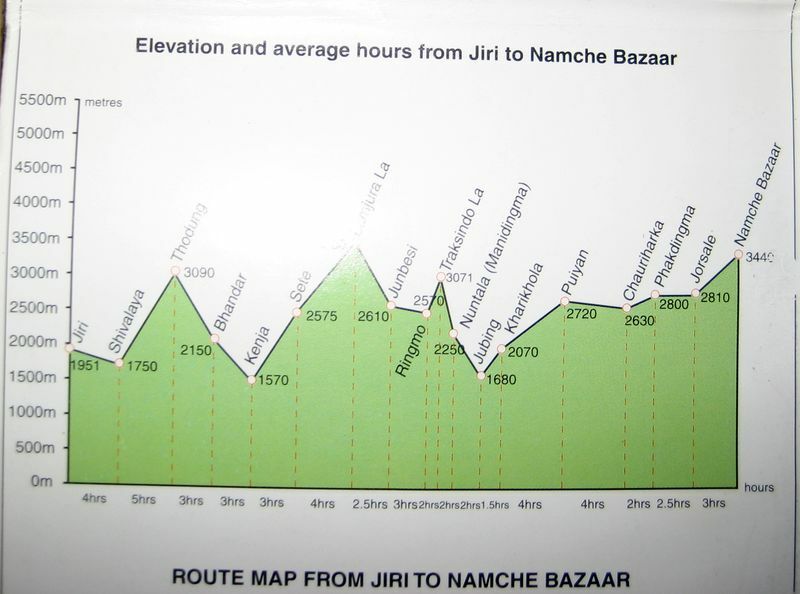 At that point you are 400 meters lower then at the start of the trek in Jiri! From here the trail is going more up then down and the next few days hover between 2000 and 3000 meter before the push up to Namche Bazaar at 3480 meter. By this time I should be well and truly fit enough to tackle the trail to Everest base camp and Kalar Patar. I know it’s a crappy picture but it gives a good overview of the ups and downs of the trek.